U.S. Attorney General Eric Holder gestures as he speaks to members of the community during an interfaith service at Ebenezer Baptist Church, the church where The Rev. Martin Luther King Jr. preached, Monday, Dec. 1, 2014, in Atlanta. Holder traveled to Atlanta to meet with law enforcement and community leaders for the first in a series of regional meetings around the country. 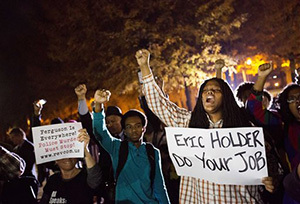 The president asked Holder to set up the meetings in the wake of clashes between protesters and police in Ferguson, Missouri. Photo Credit: The Associated Press, David Goldman. U. S. Attorney General Eric Holder will hold meeting around the country in an effort to address police and community relations with minority communities. Speaking at Ebenezer Baptist Church in Atlanta - the church where the Rev. Martin Luther King Jr. preached - U.S. Attorney General Eric Holder said Monday that he will soon unveil long-planned Justice Department guidance aimed at ending racial profiling. "In the coming days, I will announce updated Justice Department guidance regarding profiling by federal law enforcement. This will institute rigorous new standards - and robust safeguards - to help end racial profiling, once and for all," Holder said. "This new guidance will codify our commitment to the very highest standards of fair and effective policing." Holder's meeting in Atlanta included a closed roundtable discussion with law enforcement and community leaders followed by a public interfaith service and community forum. The meeting came on the heels of President Barack Obama's request to federal agencies Monday for recommendations to ensure the U.S. isn't building a "militarized culture" within police departments. The White House also announced it wants more police to wear cameras that capture their interactions with civilians. The cameras are part of a $263 million spending package to help police departments improve their community relations. The selection of King's church as the site for the meeting was significant. The most successful and enduring movements for change adhere to the principles of non-aggression and nonviolence that King preached, Holder said. Holder also told the crowd that the meetings he's convening around the country are just the beginning and that he wants to start a frank dialogue and then translate that into concrete action and results. Holder's comments were well-received by the audience. When a group of people interrupted his speech with chants and was escorted out, Holder applauded their "genuine expression of concern and involvement" and got a standing ovation from the crowd. Last year, as part of the Justice Department's "Smart on Crime" initiative, he instructed federal prosecutors to stop charging many nonviolent drug defendants with offenses that carry mandatory minimum sentences - punishments that he said were contributing to overcrowded prisons. The Justice Department has also broadened the criteria for inmates seeking clemency in hopes of encouraging potentially thousands more inmates to apply, and Holder backed changes in federal sentencing guideline ranges that could result in tens of thousands of drug prisoners becoming eligible for early release. Holder also has publicly discussed the need to ease tensions between police departments and minority communities. The Justice Department has also targeted flawed police departments, initiating roughly 20 investigations of local police agencies - including Ferguson - in the past five years. A new pilot program announced weeks after the Ferguson shooting will study racial bias in American cities and recommend ways to reduce the problem. I think the best way to monitor police and end racial profiling is to arm the police officers with cameras that record every action they take and exactly what they say. This is always in progress and being developed but that is just the beginning. lets think critical, police get away with murder and bringing in camera will do justice. I have to agree to disagree. yes cameras sound nice and all but police are dirty. lets use Ferguson as an example, the police who shot MB he has a camera and everything on his suit. if the cop was in the wrong all the evidence would be destroyed. its embarrassing to the police squad that there man that they hired were in the wrong and its probably what they are teaching them. then when the camera are shined on the dirty cop he is lying on national television. cameras might be the first step but something else need to be adjusted to that. I do respect and like Holder's outlook on the racial tensions between police departments and minorities. I feel like he understand it's a bigger problem than just Ferguson and that this overall problem needs to be addressed methodically and in the right way. I also like that he applauded protestors on making a stance even when they interrupted him. He seems to respect standing up for what people believe in, which in turn makes me respect him. Having the attorney general on board should really help and spread awareness, especially since he is looking at the overall problem. I agree with both of the comments. I think this problem is much bigger than Ferguson, and that it needs to be addressed as such. I also think it is great Eric Holder is stepping up to take especially because he is a minority. The thing that is ironic to me, is that never is the officers job spoke of. the dangers, the stress, the lack of minorities. I am sure there are wrongs done, but if that was such an easy occupation, would it be so hard to employee police officers. Education, support and diversification are all things we need. We are all people. The law is there to protect all of us. We need to address as such.The cameras are in my opinion a great start. I like your comment that the cameras are in your opinion as a great start. but where do we end? it took Eric a minute to take a stand. feel like somebody should of took a stand along time along time ago about violence and we wouldn't be in this situation. I hate what was done in Ferguson. you cant bring back her son. saying sorry is not gone replace her baby. bringing camera is not going to stop there wrong doing. some cops are ignorance and it will come down to a officer being in the same situation and when they go to check the camera it wouldn't be turned on or it only got a few seconds of what happened. there is always going to be an issue with cops and minority. the cop wins every time. !